Last Thursday during the service in Victory Church, I was reminded of how our God is so patient, understanding and forgiving. These past few weeks, I wasn't myself, I was full of negative emotions and wrong thinkings. But despite those things, He continue to protect and bless me for which I felt that I don't deserve any of it. 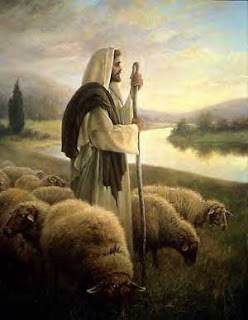 I was then realized that He is still guiding me, directing me to the right path, indeed the best shepherd. The service discussed God as the true shepherd. The pastor first mentioned the characteristics of a sheep on which some of them, I believe relates to us or defines our very own traits. The list included strong, stubborn, dependent, demanding, restless, slow to learn, straying, same everywhere, unpredictable, unattractive, copycat and fools. Despite these adjectives, isn't it great that God doesn't give up on us? Isn't it a great feeling that no matter what we do, we always have the second chance? Isn't it wonderful that there is someone that provides unending love, concern, protection and guidance? 1. Pursues Us. In verses Ezekiel 34:11 (For this is what the Sovereign Lord says: I myself will search for my sheep and look after them) and Luke 19:9-10 (9 Jesus said to him, “Today salvation has come to this house, because this man, too, is a son of Abraham. 10 For the Son of Man came to seek and to save the lost.”) mention that there is no place for us to hide, He will continue to look for us, search for us and will never give up on us. The pastor then asked us to read Psalm 23, read not only by eyes but should come from the heart. That very moment, I felt His touch, the warmth of His embrace and it was like He was sitting besides me and saying "welcome back my son, its good to have you back. I've been waiting for you". I know I'm not perfect but I am blessed that I have a perfect shepherd. We just need to listen to His voice and obey Him. It will also be a good thing for us if we are surrounded by people with the same belief and encourage us towards the correct path.